If you would like further information about the College, please feel free to contact the office and make an appointment to meet with our Principal, Steve Tresize. He will be happy to answer your questions and give you a tour of the facilities. To make an application for enrolment in the College, parents or guardians will need to complete the ‘Application for Enrolment’ form which can be downloaded above. If the family is new to the school, you will also need to complete the ‘Family Registration’ form – also above. Please make sure that you have read the College Prospectus and are fully aware of the College’s aims and objectives. It is vital that parents are supportive of the College’s Christian perspective and are committed to the values and ideals of Christian Education. A non-refundable $50 application fee is required for each application. Please include copies of recent school reports as well as any relevant medical or psychological reports. Unless it has already occurred, the Principal will most likely request an interview with the child and his or her parents. 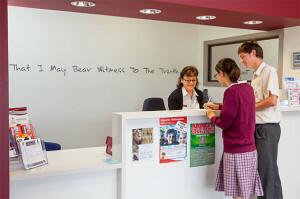 A diagnostic test is sometimes required and, if accepted, the student’s birth certificate and immunisation status will also need to be supplied.